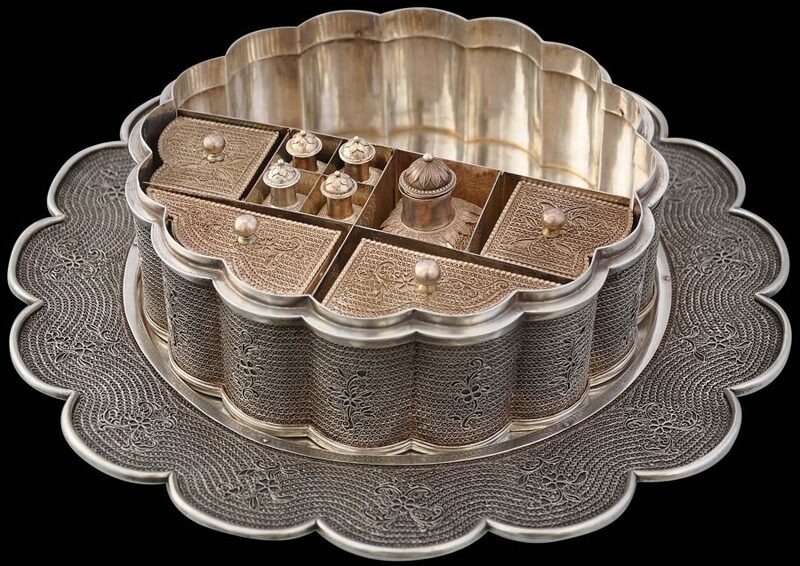 This exceptionally rare and monumental example of colonial filigree silverwork almost certainly from the Dutch East Indies, and most probably Batavia, comprises a large tray, a box, a cover, eight internal lidded containers, and internal dividers, all in silver. All the original elements are present; nothing is missing. Each main piece is stamped with a Dutch tax stamp for foreign-made silver for 1824. The date of manufacture is likely to have been earlier, most probably towards the end of the eighteenth century. 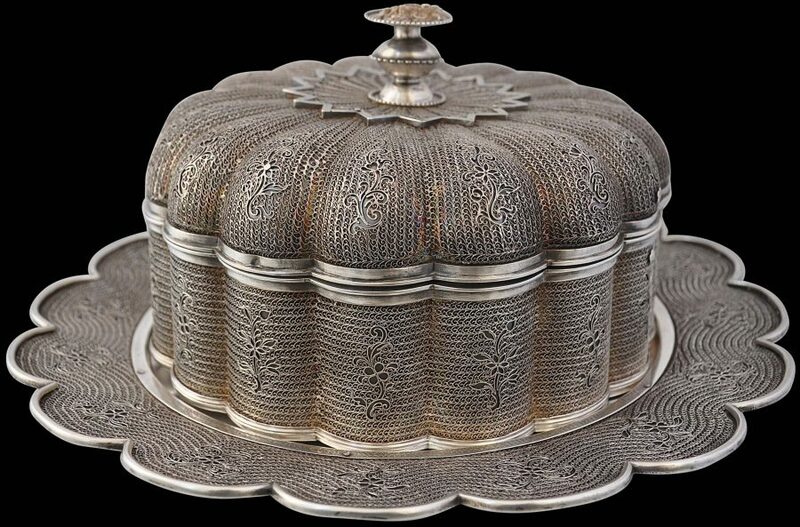 This set is one of the largest examples of colonial Batavian filigree silverware of which we are aware and certainly the largest filigree silver box. No similar item appears to have been published. 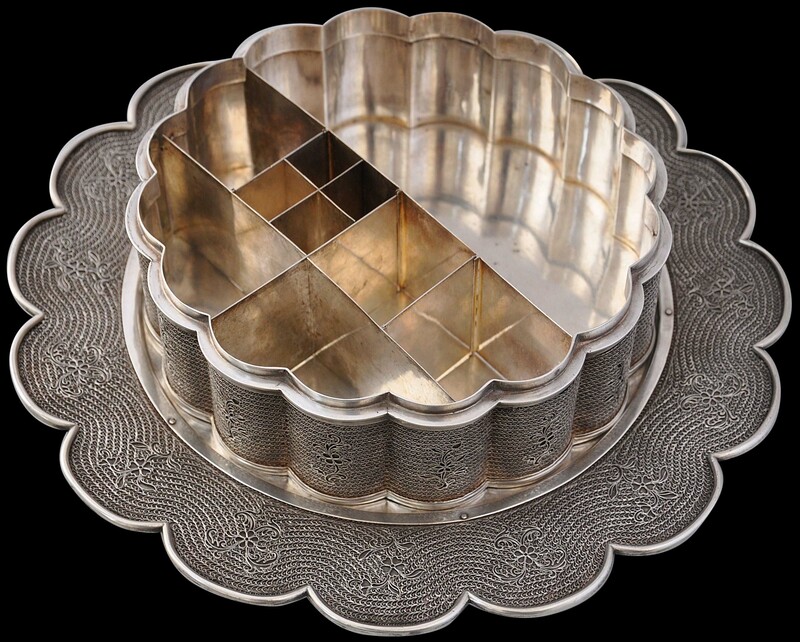 It is an exceptional piece and one that has a role in telling the story of colonial silver-smithing in the Dutch East Indies. It also brings together various elements – local Chinese-inspired workmanship, Dutch colonial demand for such luxury goods, local Islamic motifs, and Indian forms. Together these elements tell an evocative story of eighteenth century trade, of European, Indian, Islamic and Southeast Asian interaction, all within this one piece. 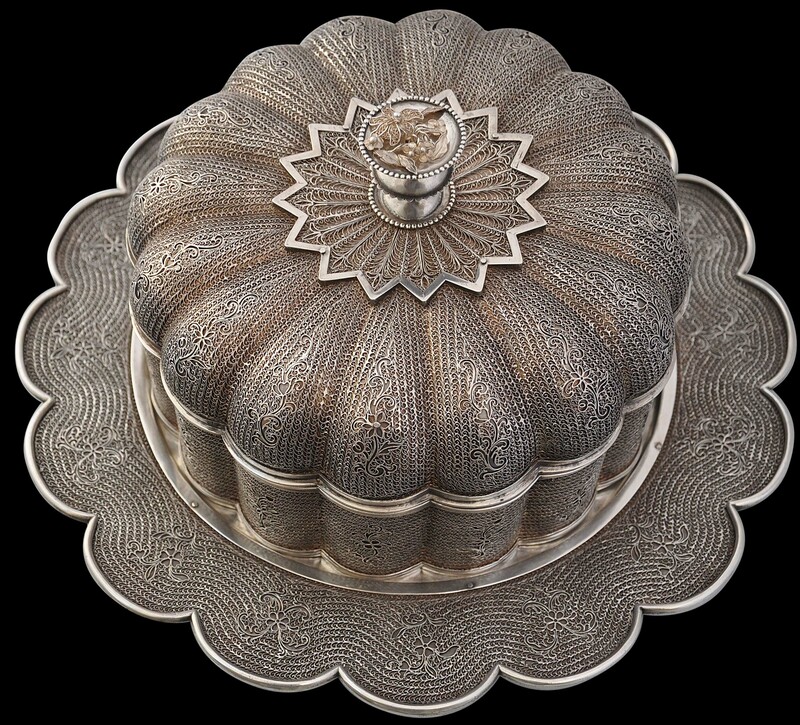 The form is that of a large Mughal Indian pandan or betel nut box. Typically such boxes had a lid and sat on a low, footed tray. But the interior reveals the box to be not for betel but a toiletry box set, no doubt made for a Dutch colonial woman. The superbly-rendered sixteen-pointed star on the top of the box shows the Islamic influence and is reminiscent of the filigree silver, gold and suasa motifs on jewellery, betel boxes and dagger and sword casings made in Sumatra for local sultans and their courts. 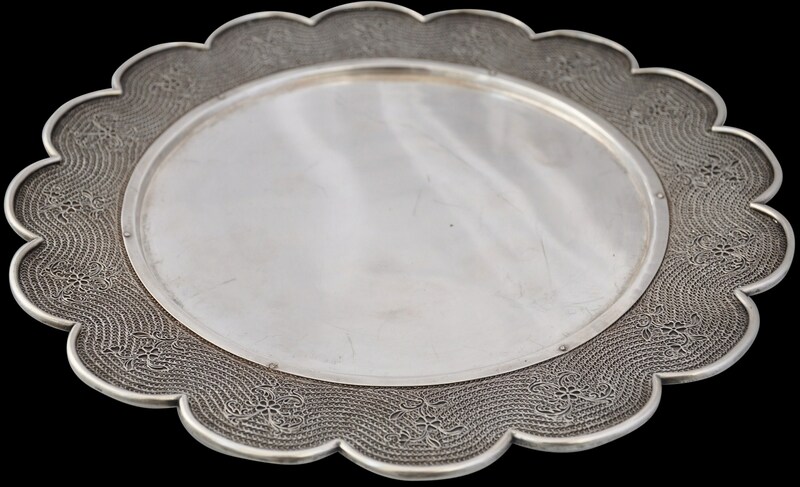 The set includes a large scalloped-edged, double-walled tray that stands on three tiered-edged feet and with a rim covered with filigree silver wire arrayed in fine, wavy bands of filigree curls interspersed with floral and leaf motifs. The floral/leaf motifs relate to motifs seen in the indigenous Islamic Malay gold jewellery of South Sumatra. The edge with a raised, rounded rim comprises sixteen prominent scallops. The three feet attached to the bottom of the tray are original to the box. 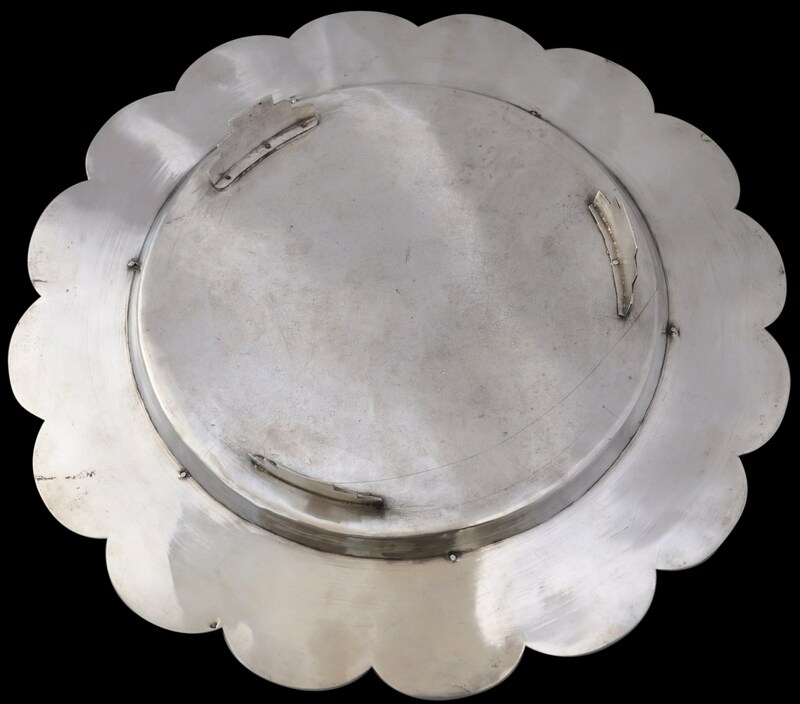 This is clear from the construction – they have been riveted to the base of the tray but the tray comprises two layers of silver sheet and the rivets have been driven through the lower layer but are not apparent on the upper layer. Their shape might appear to be art deco in form but in actual fact, their stepped form can be found in the stepped outlines of the roofs of seventeenth and eighteenth century shop houses of wealthy merchants of central Amsterdam and on some colonial buildings in Batavia. 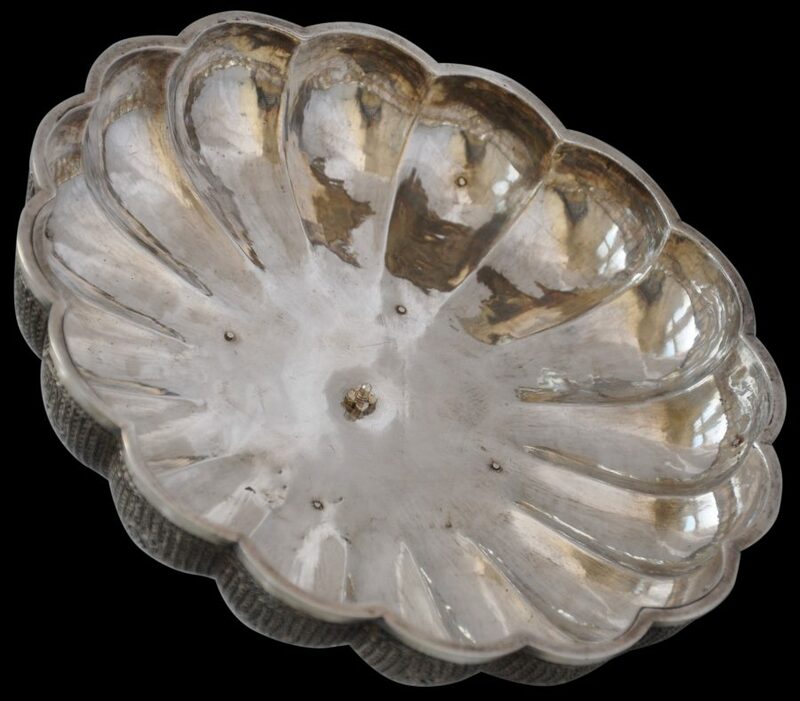 The rounded box, which sits in the well of the tray, comprises filigree covered silver sheet scallops that might also have been lightly gilded. The filigree has alternating flower and leaf motifs on each scallop. 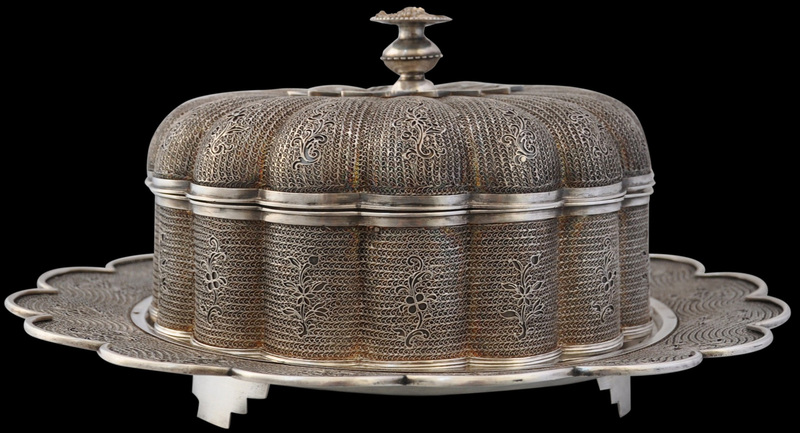 The domed lid, with sixteen lobes, is covered in fine filigree again with alternating floral motifs. At its centre is a large, splendid star with sixteen points each of which is infilled with filigree. 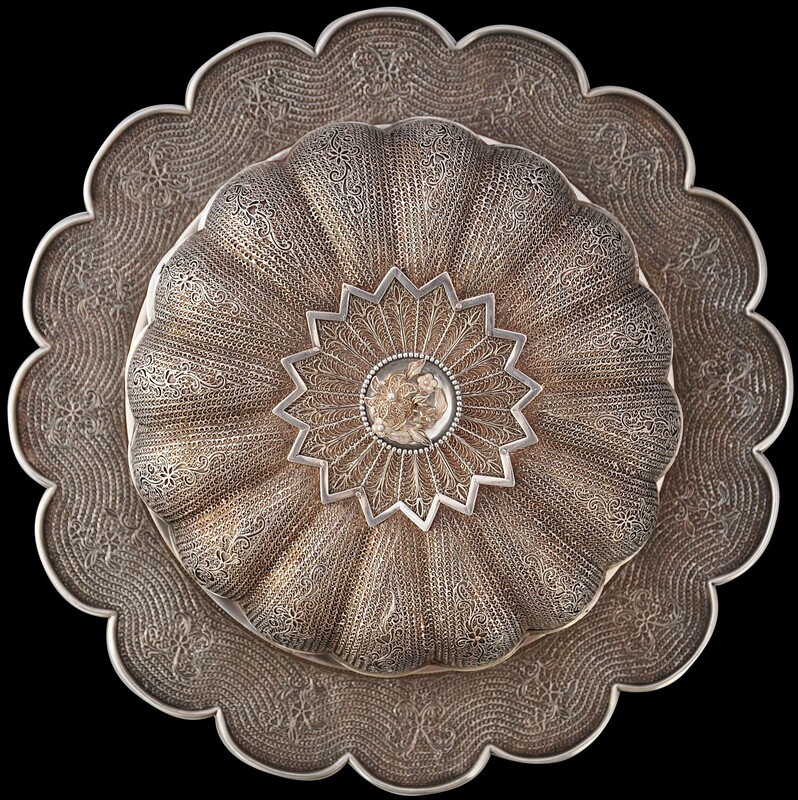 As mentioned, the form of this star has parallels with traditional filigree gold, silver and suasa work from Sumatra. 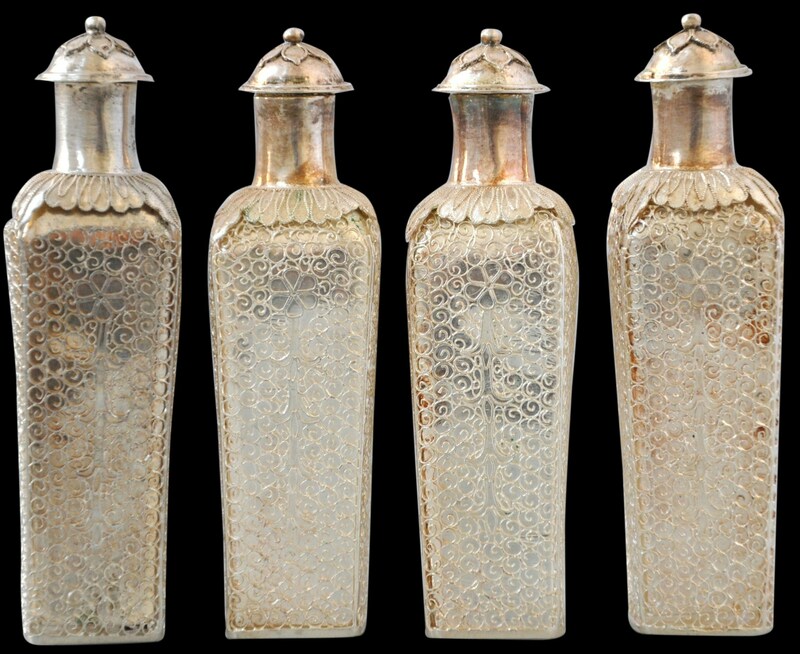 The lid finial or pull-handle is decorated with beaded and delicate serrated edging. 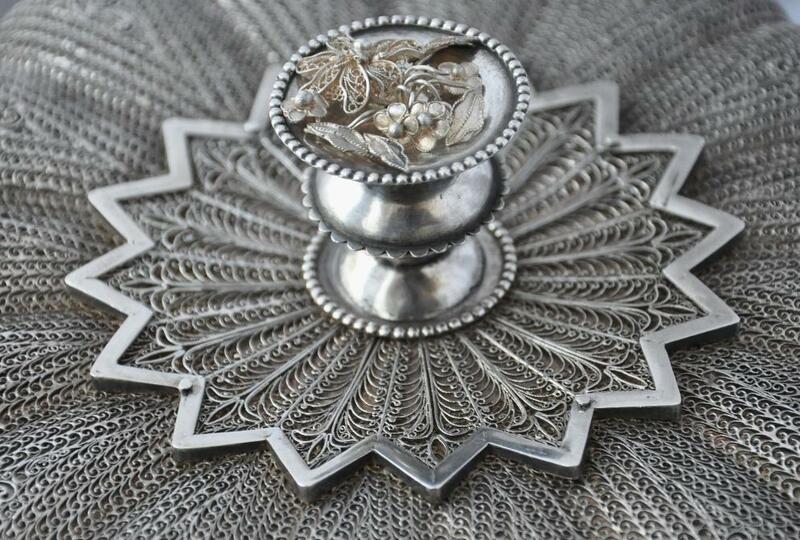 The top has a fine floral and leaf spray in silver filigree. 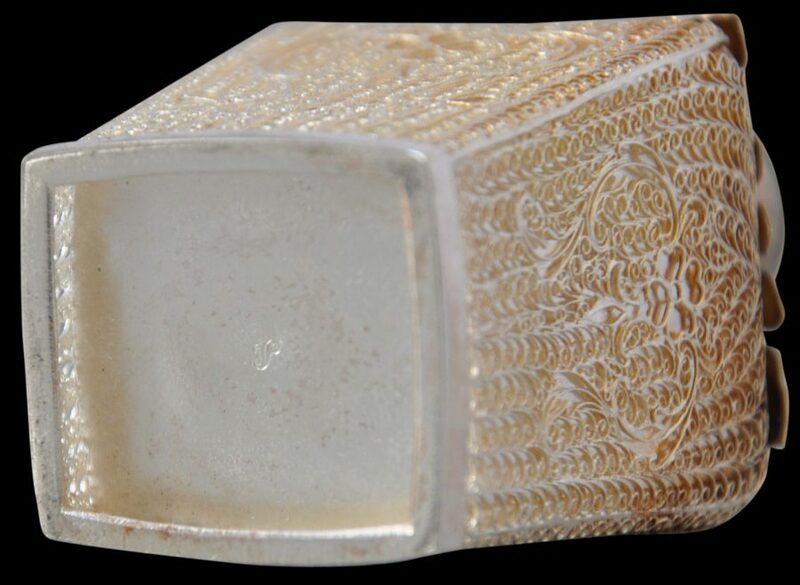 Such work is apparent on a lidded filigree box attributed to eighteenth century Batavia that is illustrated in Voskuil-Groenewegen (1998, p. 66). 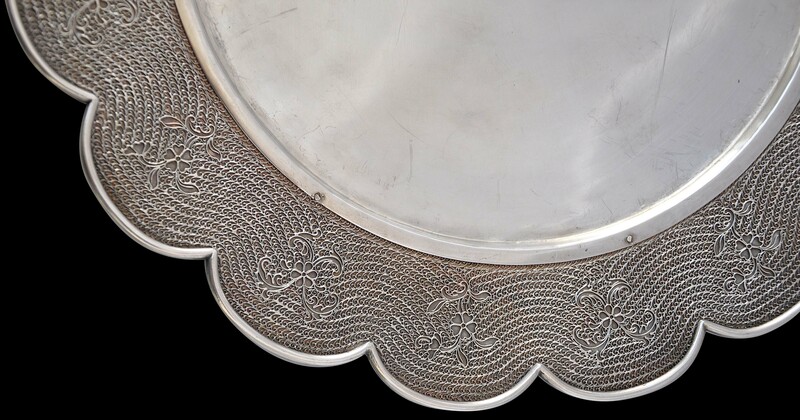 The severity of the scallopping of the rim has parallels in the silver salvers commissioned by Dutch administrators and their families from silversmiths in Batavia in the seventeenth and eighteenth centuries to commemorate marriages, deaths and other important life milestone events. 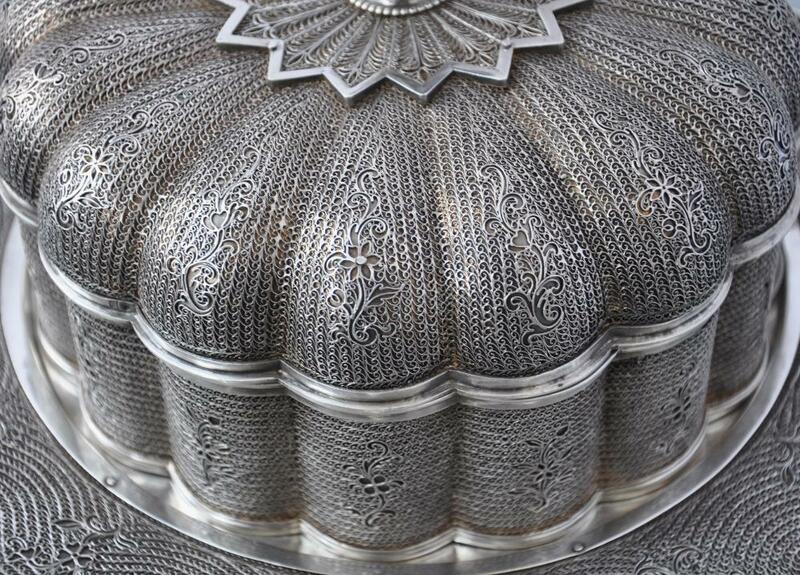 The bulbous scalloped cover has its parallels in Indian Mughal pandans but also in the lids of the Dutch-inspired two-handled lidded bowls also commissioned from Batavian silversmiths. (See Voskuil-Groenewegen, 1998, p. 28 for an example.) 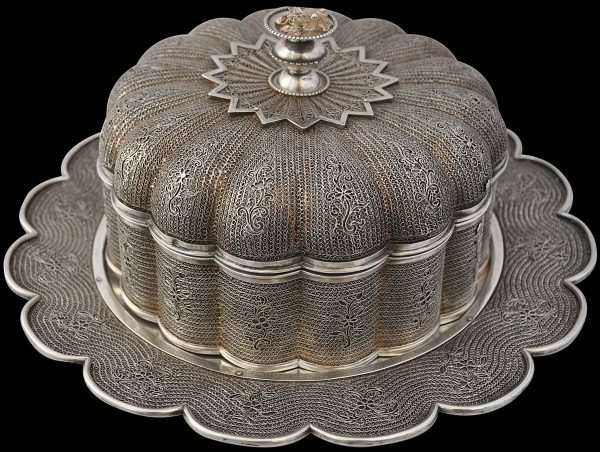 It is as if the box and tray have been made by a craftsman who is familiar with the form of a Mughal pandan but not overly. The interior of the box has space on one side perhaps for a lady to keep her gloves or small brushes and combs. The other side has dividers of sheet silver making separate compartments for each of four fitted boxes and five scent bottles. 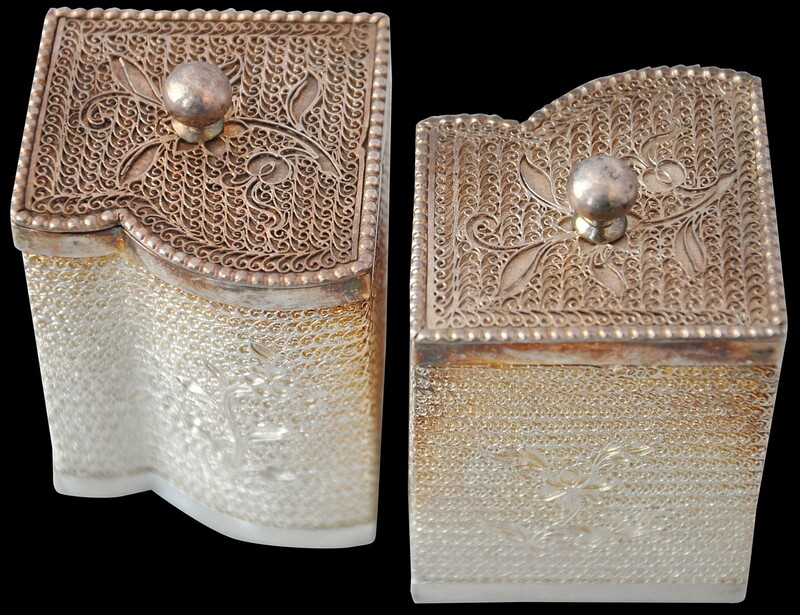 Each box has sides and a lid with covered with silver filigree that includes floral and leaf motifs. 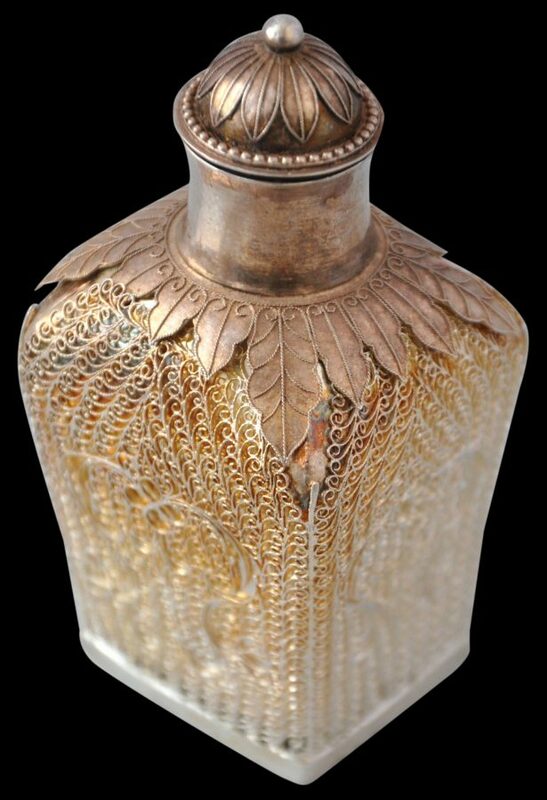 The scent bottles similarly are decorated but with the inclusion of collars of sheet silver and filigree leaf ornamentation. The four small scent bottles have screw in lids, whereas the larger scent bottle has a pull-out lid. Each lid is domed and decorated with a petalled flower motif. 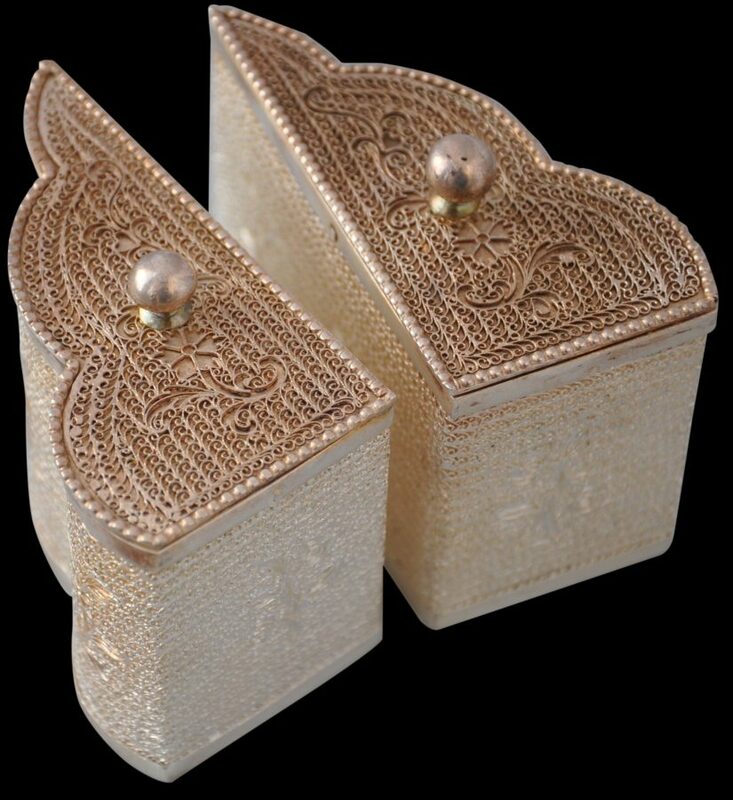 The technique of applying a fine filigree ‘fabric’ over a sheet silver is most closely associated with small rectangular jewellery caskets that have become known as ‘Batavian boxes.’ Sometimes, it is assumed that such boxes are made in China, despite the Batavia appellation. Eighteenth century Batavia is the more likely provenance for this group of boxes. Certainly filigree work of this type was undertaken in Batavia and Sumatra in the 18th century. Indeed, a considerable volume of silver, including filigree work, was produced for the United East India Company orVereenigde Oost-Indische Compagnie (VOC) in Batavia in the eighteenth century. How much of it today is catalogued as ‘Chinese’ or ‘Indian’? Probably a great deal of it. For whom was this toiletry set made? Possibly it was made for export to Europe. But then European toiletry sets appear to have been made to sit over a dressing table, seemingly obviating the need for compactness evidenced in this piece. So perhaps the piece was made for a VOC wife whose life could be expected to be one of cross-postings to any of the VOC’s other Asian settlements involving arduous sea travel. Some VOC wives actually lived aboard ships that were moored in the VOC’s ports, again suggesting the need for a set such as this. Perhaps the set was a presentation piece; a farewell gift. The set is heavy: weighing more than two kilograms, no silver has been spared, so the set seems to have been commissioned. Another possibility is that the set was made by or for a member of Batavia’s Mardijker community. The Mardijikers were Creolised Indians from Portugal’s Indian settlements. The VOC legislated for them as a distinct group in Batavia. Of Indian descent, but largely Christian and Portuguese-speaking, the Mardijkers became a relatively wealthy but cohesive and distinct community. The men wore Portuguese silk shirts and plumed hats but went without shoes, an incongruous mix much commented on by visitors to Batavia at the time. They were self-employed as traders and shopkeepers and established sugar plantations on estates around the city. The Michiels family was one of the more prominent Mardijker clans in eighteenth century Batavia. The family accumulated massive landholdings and the head of the family was appointed by the Dutch to be the Mardijker community spokesman. (Gelman Taylor, 2009, p. 47, 60). The community was distinct, wealthy, partly Europeanised and partly Indian – it would not be surprising therefore if this set was made for a wealthy Mardijker wife, perhaps by a Mardijker silversmith. This would explain the form of the tray and box: reminiscent of a north Indian pandan rather than have such a pandan’s precise form. The possibility of it being made by a Muslim Indian craftsman exists also and may be equally likely. Again this would explain the Islamic and Mughal nature of the decoration and the form. Certainly, the extravagance of Batavia’s multi-cultural Mestizo culture was a contrast with the relative Calvinist severity of how the Dutch conducted themselves in Holland. In Batavia, the display of luxury, the grandeur and the need for public display of wealth and position saw the need for the services of very talented goldsmiths, silversmiths and other similar craftsmen, quite apart from the need generated by official exports of luxurious curios to Europe. Batavia was the VOC’s most important Asian operation. It was the administrative, managerial and maritime centre of the VOC’s Asian activities, and far exceeded the Company’s other posts in terms of size and importance. The products bought by the Company from across Asia were shipped to Batavia from where they were trans-shipped to Europe and elsewhere in Asia (Stevens, 1998, p. 88). Also, Batavia became an important producer of luxury goods which traders from many parts of Asia exchanged for textiles, porcelain, coins and medicinal products from China, India and the Arab world (Gelman Taylor, 2009, p. xxviii). Batavia itself did not take on an exclusively Dutch complexion. The VOC garrison in Batavia in 1622 for example comprised Germans, French, Scots, English, Danes, Flemings and Walloons as well as Dutch (Gelman Taylor, 2009, p. 6). Furthermore, the shortfall of European women meant that many of the European men took local wives or concubines. The VOC even purchased women on Asia’s slave markets for the purpose. Their households took on a Mestizo character. Seven Batavian-style boxes are in the toilet set of Catherine the Great of Russia. These are in the Hermitage Museum today and have been ascribed to China, 1740-1750, (Piotrovsky, 2006.) The attribution to China seems to have originated with an inventory list of the Winter Palace of 1789 which lists the set as being ‘Chinese’. Russia did not have its own East India Company equivalent. It traded with China by land or ordered goods from the East India companies of other European nations, most particularly the VOC of the Dutch. It is quite possible that Chinese-looking items ordered from the VOC were assumed in Russia to have their origins in China rather than Batavia or India. It is also quite possible – likely even – that elements in the Empress’ toilet set do not all share the same origins; that the VOC acting as producer and retailer assembled the set from items made in Batavia, China and even India and then marketed the assemblage as a set. As mentioned, a casket of similar form and decoration attributed to the third quarter of the eighteenth century Batavia is illustrated in Voskuil-Groenewegen (1998, p. 66). Similar pieces from another toiletry set from the Prussian and Germany royal von Hohenzollern family and in the David Chan Collection are illustrated in Chan (2005). These are attributed to the mid-18th century. A Batavian rather than a Chinese provenance for many of these items seems likely, all be it perhaps by local Chinese or Indian (or Mardijker) silversmiths. Indeed, for much of the eighteenth century most of the population of colonial Batavia comprised ethnic Chinese. The toiletry box set here is an important piece. We know of no other example. Its size is remarkable, as is its condition: there are few losses and no obvious restoration. The presence of Dutch tax stamps assists with its dating when many other examples of this type of work have no marks excluding anything approaching definitive dating. This is an exceptional, museum-worthy piece, and quite possibly this represents a once-only opportunity to acquire such a unique and large piece. 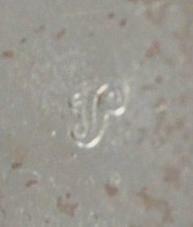 One of the Dutch tax stamps for foreign-made silver pertaining to the year 1824. This example is from the base of the larger scent bottle. The underside of the tray. The interior of the lid. The tray without the box. The four smaller perfume bottles. The larger perfume bottle The underside of the larger perfume bottle. The four fitted boxes with lids. Gelman Taylor, J., The Social World of Batavia: Europeans and Eurasians in Colonial Indonesia, 2nd ed., The University of Wisconsin Press, 2009.